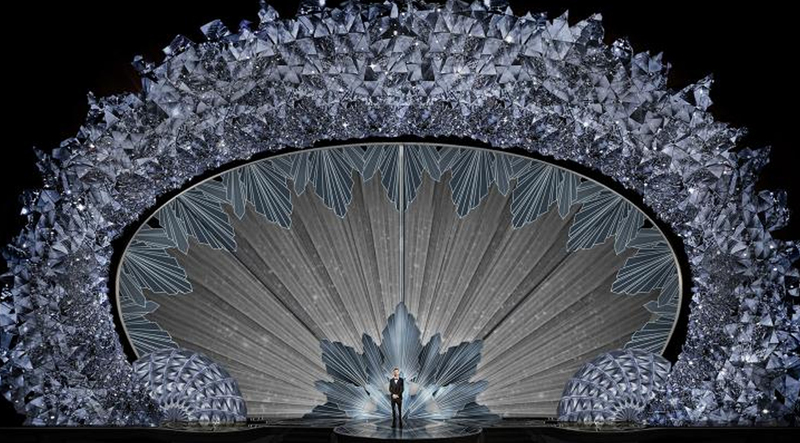 When production designer Derek McLane’s even more sparkly masterpiece for the Oscars‘ stage was unveiled to the world in March, everyone from superstar singer Katy Perry to viewers took to social media wondering about the possibility of an award show winning an award. As it stands, there is, in fact, a Primetime Emmy category for award show production design. This year, it was known as “Outstanding Product Design for a Variety Special” for the first time. Previously, the category included variety, nonfiction, event and award specials as well as reality programming. 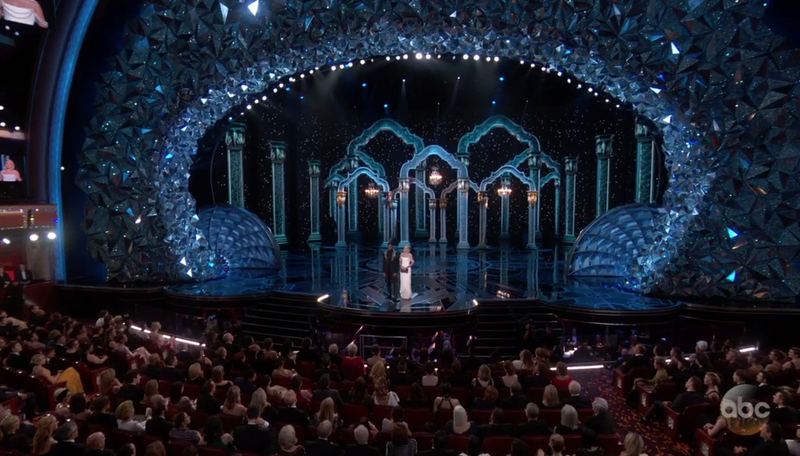 While the 2018 version of the Oscar set, resplendent with 45 million Swarovski crystals, was far the most elaborate so far — hence the attention it got — McLane’s work for the Oscars goes back to 2013. “The Oscars have partnered with Swarovski (Crystals) for a number of years. That said, I haven’t used them just for the sake of using them. 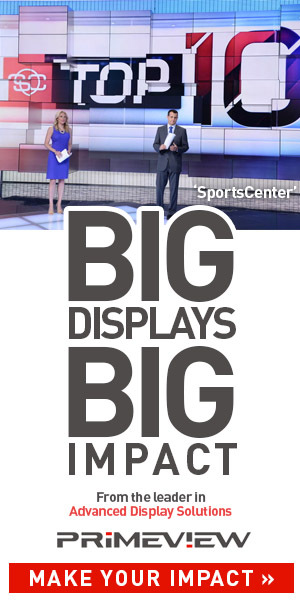 Their use has been driven by particular design needs (and) I think it will continue to be,” said McLane, whose design won an Emmy in 2014. McLane also won an Emmy in 2017 for “Hairspray Live” and was nominated for his work on “The Wiz Live” in 2016. These days, McLane has wrapped up work on “Moulin Rogue” for Broadway, which has also garnered considerable attention. Although McLane’s elaborate production design for the 2018 Oscars didn’t snag the Emmy during last week’s Creative Arts Emmys (it lost out to Fox’s live production of “Jesus Christ Superstar”), the dramatic theatrical look and feel sparked a good deal of attention. “Most of my work is on Broadway and in the New York theatre, where I don’t think I have ever used crystals. I am very interested in patterns and how to make designs out of them. I love to make patterns out of ordinary objects,” said McLane in an interview with NewscastStudio. Ironically, the use of crystals in a live television production is actually a bit challenging — “(they) need an enormous amount of light — side light or back light — in order to look beautiful on television. Figuring out how to make that happen, and where to bury the light spill is often big challenge,” explained McLane. Despite his high profile use of crystals at the Oscars, McLane has an impressive portfolio that spans many genres and don’t include crystals. “The Wiz Live,” for example, was designed and laid out like a Broadway show, with video walls serving as a series of digital backdrops — a technique that also appears in his work for the Oscars. Meanwhile, his work on “Hairspray Live” was approached more like a live movie. This production design also required the look of 1960s Baltimore in both interior and exterior scenes. No matter what the production, at the end of the day, McLane points out he is ultimately a storyteller at a heart. “My interest is in telling a story. I am much less interested in style than I am in telling in a fresh or surprising way,” he said. “All sorts of things inspire me. Construction sites, photojournalism, especially from other parts of the world, art exhibits (and) industrial objects,” explained McLane. “I also mentally collect details, particularly to use in realistic sets. I collect cool looking spaces and then try to find productions where I can use them as inspiration,” he explained.